Many people do not know where to begin when they become victims of online defamation. They may search the internet and come across many sites containing technical jargon which might confuse them further. Here I have put together 5 easy steps you should take if you are being defamed online. If you follow these steps you will be able to respond to online defamation more effectively. 1) Be discreet. 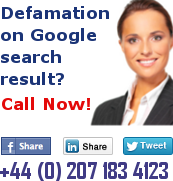 Tell as few people as possible about your internet defamation issue. The more people you tell the more popular the link will become and the higher it will be ranked in search engines. This even includes close friends and family (although you may tell them not to click on the link, the curiosity may get the better of them). 2) Be sensible. Evaluate whether it is in your interests to respond to the internet defamation. This depends on the nature of the defamation that you are experiencing. Be cautious about how people will perceive your business following your online response. Some victims of online defamation reply out of anger but try to remain calm and focused. Sometimes it is best just not to reply as you may be disfavouring yourself if your response is driven by emotions. 3) Be proactive. Consider using blogs to try and push the defamatory web pages out of public view. You do not have to be a writing expert to begin writing about yourself or your company. Google enables people to set up free blogs and these can be quite effective in communicating your message and enhancing your online reputation. If you act on behalf of a company, write several blogs about the products or services the company offers and tell people more about your organisation. If you are an individual whose reputation is being attacked online then you too should write blogs, they do not have to be overly detailed. 4) Act accurately. It is important to seek online defamation professional advice. Looking for good PR, SEO and reputation management specialists is a good place to begin. The Internet Law Centre comprises all these skills and is able to give you all rounded advice to help you tackle your online defamation. 5) Act quickly. Depending on the severity of the online defamation- act quick, don’t ignore and assume it will go away. The quicker it goes the better may sound like common sense but you would be surprised how many people leave these things to just get worse. Visit the Internet Law Centre for tips on how to deal with online defamation.